This beautiful country house is located in the tranquil countryside, but is just 2km from San Jose. Some of the most beautiful beaches of the west coast, like Cala Bassa and Cala Conta, are within a radius of 10km. What immediately strikes you as you walk up this plot is the beautiful and spacious garden that stretches out up to 3,000m2. There are many palm trees and the trails are neatly trimmed with natural stones. A heated swimming pool surrounded by a large terrace with 12 sunbeds is to be enjoyed. The outdoor area has a kitchen with BBQ and a dinner table that seats 12 people. The house itself was originally a farm. This is clearly recognizable in the old wooden beams in and around the house. The original features of the property have been preserved, while the interior has a modern and luxurious look. The house consists of two parts: the main house and a separate bungalow. The interior of the house is spacious. Also here, the house has been decorated tastefully while respecting the original features. Natural stones, wood and light tones give the house a peaceful feel. For lovely dining experiences two dining tables that seat 12 people, are to be enjoyed, one inside the house and another in the outdoor area. 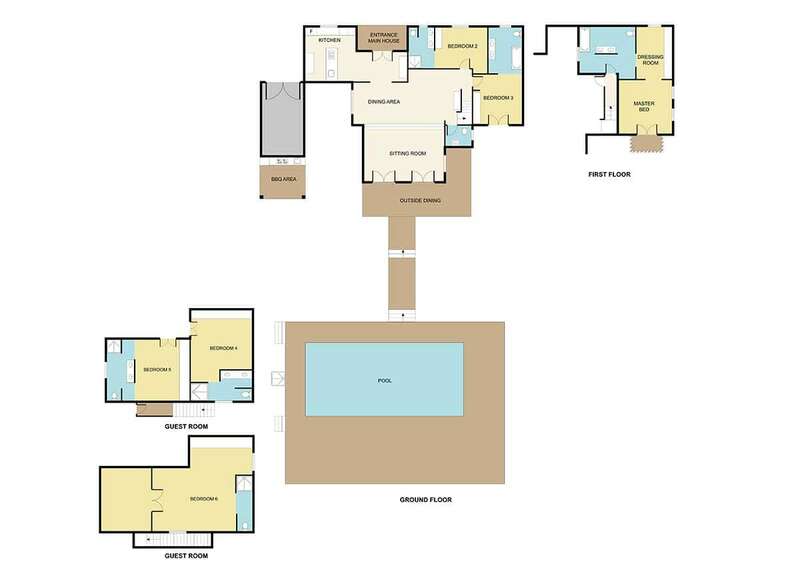 On the ground floor there are two bedrooms; one with two single beds and an en-suite bathroom. 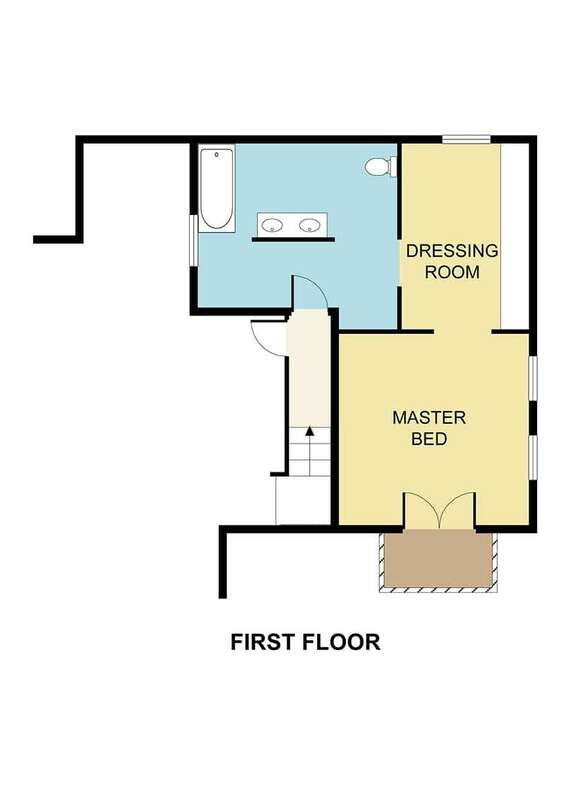 The other bedroom has a double bed and an en-suite bathroom with a bathtub. For guests there is a separate lavatory. The modern gourmet kitchen is fully equipped with two fridges and two dishwashers. The terraces are accessed from the living room and the kitchen. The master bedroom is on the first floor in the main house. Just like the rest of the house it is furnished in the same style. This room has a double bed and a large en-suite bathroom, with a bathtub. Apart from the house there is a bungalow that is situated in the garden next to the pool. 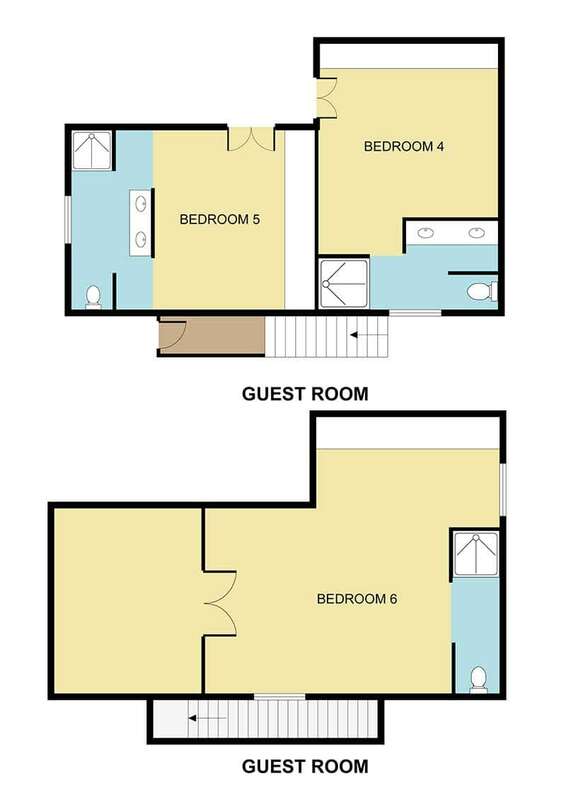 On the ground floor of the bungalow are two bedrooms, one with two single beds and one with a double bed. Both rooms have an en-suite bathroom and access to the terrace. 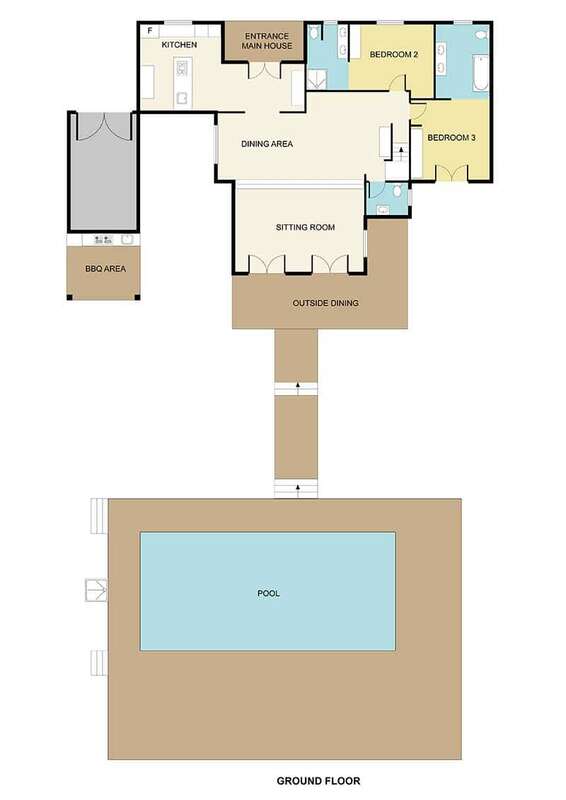 On the first floor is another large bedroom with a double bed and en-suite bathroom, as well as a private terrace. For the kids to enjoy playtime, there is a table-tennis table and a basketball hoop. A Sonos music system around the house adds melody to the entire property. The pool area offers 12 sunbeds. Additional service: In July and August 6x p.w. 4 hours cleaning, de rest of the year 2x p.w. 4 hours. All year 1x p.w. change of towels. Washing machine 9 (2x), tv in every room, outside shower. Fantastic location to spend your dream vacation. Luxury, comfort, beautiful garden, everything is in stock. Perfectly centrally located to discover the island. Near downtown San Josep but still very remote. Fantastic beautiful house. swimming pool, umbrellas, BBQ and kitchen need better maintenance. It's in 1 word a great house! Nothing missing, I can not figure out anything that was not available, everything was super clean. We were 8 adults and 4 grandchildren, all of us having fun, especially because the pool had a lovely temperature, everyone could really spend the whole day in it. It is advisable to rent a car, as it is not really within walking distance of shops. But compliments also for the lady who arranges the cleaning, she is very nice. We would book again for a week, think that every other house now would be a disappointment. This house fits us into 1 word: amazing !! The villa has met all our expectations and is fully equipped. We had a fantastic week's vacation. We have had a wonderful holiday at Cala Rumani it was perfect for our family get together in every way. We would love to return . Very beautiful and complete villa. Top villa! Can Rumani was a much better villa than the pictures suggest which seems difficult to imagine!! We had a great time at the villa and thoroughly enjoyed the whole outdoor experience of BBQ area, dining areas and pool. The house is immaculately presented with all rooms particularly well furnished. The kitchen had all the utensils you'd expect to see at home whereas some villas fall well short in this area. My one word of caution relates to the villa being about 1/2 a mile down a dirty old track. I don't think this is mentioned at all on the website!! Its fine with a car but you are unlikely to walk along it and getting taxis to come to the villa is almost impossible. Theresa the wonderful cleaner managed to arrange taxis to the Villa using her contacts but given their is not a full postal address for the villa it was difficult for us to arrange ourselves. We had the perfect holiday. The house was great for a few young families sharing and the garden and the pool kept the kids entertained for hours. The housekeeper was amazing and it was a real treat getting fresh linen and towels. We will be back next year! A beautiful house with beautiful pool where everything has been thought. We were 12 people and had a fantastic time here. In the cottage are many accessories available such as a ping pong table and foosball table, which was highly appreciated. The house was beyond expectations. We did not expect that the details were so fine.